What’s up, everybody. Listen, I wanted to share a couple of things I bought over the weekend at my favorite metaphysical gift shop located within the city. The place is called The Dream Maker (here’s a link to their website: http://www.dreammakershop.com), and my best friend and I absolutely love this place. 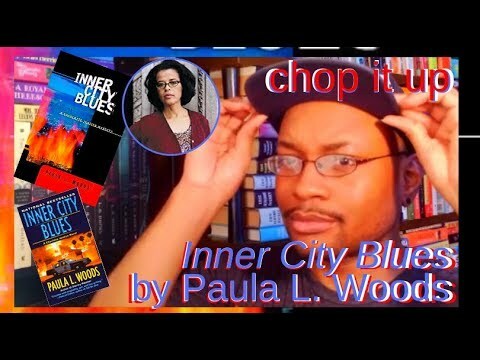 We kind of discovered it over a year ago during a time where a few unexpected twists were happening in both our lives and relationships with others. However, in a general sense, we've always loved and believed in stuff (I really don’t mean to use the term “stuff” lightly) like this. Nevertheless, the Universe and its timing during periods of necessary growth and change is always on point. Our Dream Maker visits helped “charge“ and motivate positivity into our lives. Or at least helped point us in the direction of alignment with the positives. It started with collecting crystals and gemstones (which I suppose I should share) and moved into collecting all sorts of other things, including this jade frog I keep near my door to attract money. I adore the frog regardless, though. My intention on this weekend visit was to find a large quartz crystal point to help jump start my established crystal/gemstone/rock collection for the New Year. However, I walked out with all Native American items, along with a bill that was shockingly less than $40. I had a lot of assistance in making my decision; the shop keepers/employees are extremely friendly, helpful, and suggestive. Every time my best friend and I leave the place we always smile about how good we feel. We're always excited about carrying on that feeling with our new acquisitions. 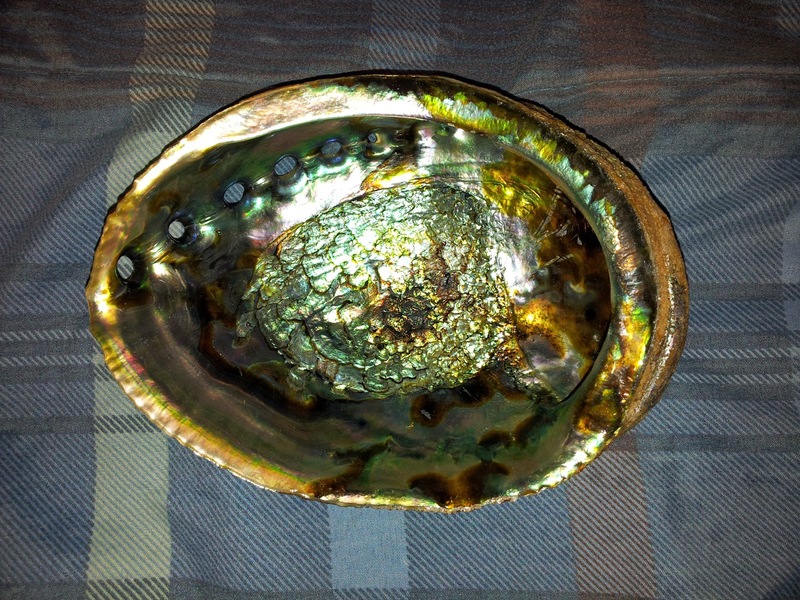 It didn't take much convincing for me to purchase this shiny abalone shell. I looked at many handcrafted boxes and bowls to see what would suit as a new bed for my crystals/gemstones to rest inside before deciding the shell might work and look cool at the same time. As always, the shopkeepers and their little item description tags helped move my decision. 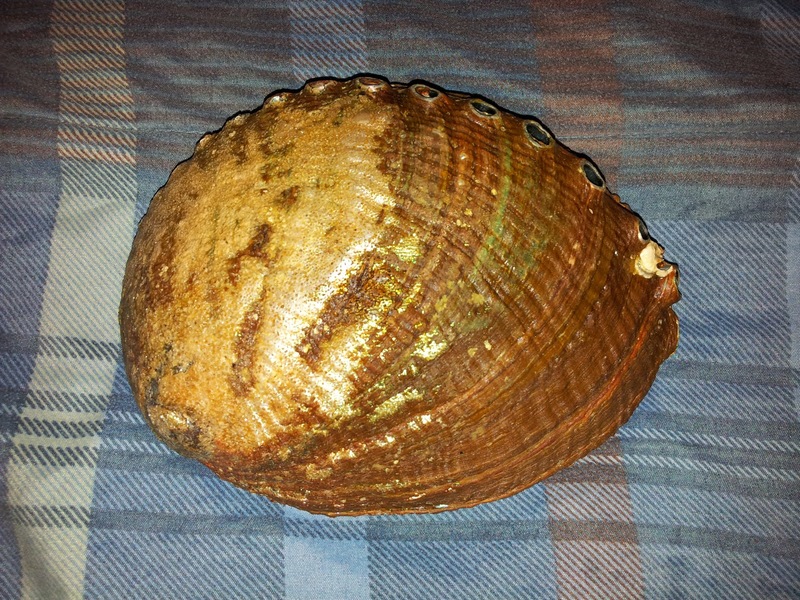 Apparently, abalone shells are known for providing growth and clarity within individuals, as well as assisting with smudging practices/ceremonies. Considering we’re talking about metaphysics, this is vibrationally speaking. So I went about picking me out a nice one, as you see here. However, I didn't use it for gemstones after I floated around the shop catching my eye on something else I could use the shell for. One of the shopkeepers was busy rearranging a shelf of new items while I was picking through other Native American products, and reading up on something called wishing paper. As I am somewhat easily excitable and loud in places like this, the shopkeeper eased over to explain their new product called incense powder. Ordered by a company called Anna Riva, they were new and selling really well in the shop--according to the shopkeeper. Curious as I am, I saw that each bottle had a tag explaining what each mixture of power represented. One simply titled “Job” was self-explanatory. However, there were others like “Desire Me” and “Drive Away Evil” that really had my curious. I decided to give this a go, asking the shopkeeper if it would be okay if I burned the powder incense in my new-found abalone shell. He said it would work, but I just learned that heat transfers quickly through the shell. I burn very little powder on a stable surface after nearly melting a hole into my PS3. Anyway, after a short deliberation between choosing the “Five of Love” powder or the “Quick Money”, I chose the “Quick Money” powder. Hey, I want to travel aboard some time this year. Don’t judge me. Besides, the “Quick Money” powder smells amazing. Straight out of the bottle it has an airy lemon scent. 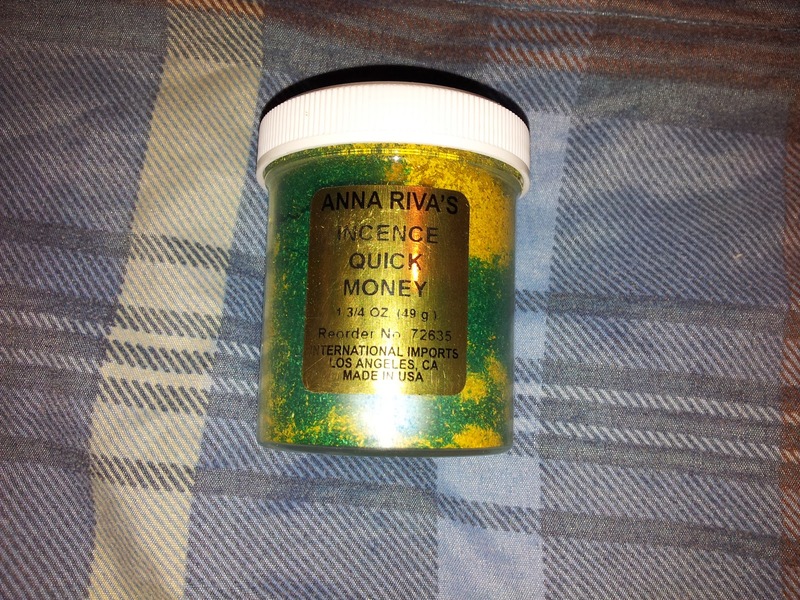 Unsure of the practices of using incense powder, I researched Anna Riva’s website (I’ll link it here: https://www.annarivas.com) to get some facts. According to the site, using “Quick Money” required the user to write the amount they wish to receive on a piece of paper. Place the paper underneath the instrument housing the burning incense and repeat each day. 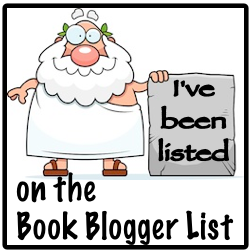 I’m on day three and I can say that after five months I finally made another sell in my Amazon Marketplace shop. Not to mention Sunday I found a dollar on the ground at work and gave it to a customer who was short on change. The last thing I’m listing was actually the first thing I picked up during the visit. I was just attracted to this item right away. It’s a brass chime if I’m not mistaken. There really wasn't much discussion over this item while I was in the shop, only that I was interested in this particular color. Nevertheless, my intentions was to use the chime as a means of musical meditation. Something about the tinkering of the chimes exudes calmness. 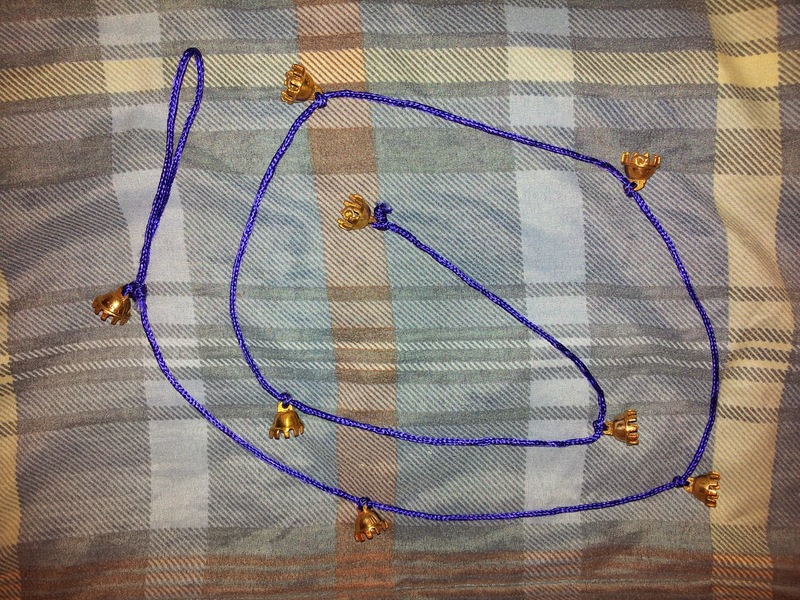 If anyone has any information or suggestions for its use, please pass it on to me. Toward the end of our visit, the shopkeeper and owner took out some of the flying wish paper that I mentioned earlier. They were allowing some customers to try them out, seeing that this was a new in-store product. Made mainly out of rice paper, the purpose of flying wish paper is to send your wishes out into Heaven/Universe where they can come true, or manifest into your life. Needless to say, I was thrilled to have the opportunity to give it a try. While it was difficult to write clearly on the paper itself, I let my intentions do most of the “writing” as I took an extra three minutes making my inner self clear. After you write your wish on the paper, you roll the paper up into a tube then light a match to it. The minute the flame touches the paper, the wish paper takes off. Because we were inside we lit the paper and watched it lift, almost smoldering in the air. The shopkeeper caught the burnt paper in plastic baggies and instructed us to take them home and release them there. I did so the next morning before work, but hours before then, I walked out of The Dream Maker feeling both elated and comforted by the whole experience. Can anyone guess what I asked for on my paper? I'll hint that it was two things.